The Ventura Dodgers were crowned 35 Wood Bat baseball division champions with a 7-2 win over the Arizona-Utah Rockies. The Dodgers are managed by Brad Milner. 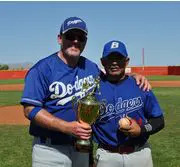 Eddie Ramirez’s RBI triple in the opening frame set the tone as the Ventura Dodgers defeated the Arizona-Utah Rockies 7-2 in the 35-and-over wood bat tournament division championship at the MSBL’s Las Vegas Open. three and striking out five. Donnie Schuoler’s RBI double in the fifth inning was the only other extra base hit in the Dodger’s 16-hit attack. Eight Dodgers, including Schuoler and Ramirez, had two hits in the game. Three run rallies in the second and fifth innings sealed the win for Ventura. Lopez earned tournament MVP honors by pitching 18 innings on the final day of the tournament. Lopez was also the winning pitcher in the Dodgers’ 10-3 win over the Las Vegas Warriors. The Rockies knocked off the Clearwater Tide 10-5 in the opening playoff round, then won a hard-fought battle against the Las Vegas Bears 1-0 in the semifinals behind the pitching of manager Gary Bowman. Bowman threw the first five innings of the championship game but left after the fifth due to an injury. He allowed six runs on eight hits. Mike Moore finished up and allowed just one run on eight hits and no walks. Julio Lopez (right) was named tournament MVP for the Dodgers. “It was a hell of a game, but we lost it at bat,” Bowman said after the contest. Milner was proud of his team’s winning effort through the grinding tournament in which they played six games in a span of 48 hours. The Dodgers included players from all over California, but they seemed to gel quickly, according to Milner. The pitching staff allowed just 13 runs in six games. WP- Lopez. Leading hitters – (2 hits) Dodgers – Bletscher; Ramirez, Schuoler; Warren + 2RBI; Foster; Swanson; Johnson. Milner 2 RBI. The Arizona-Utah Rockies had a good run at the 2012 Vegas Open but finished second. They are managed by Gary Bowman.